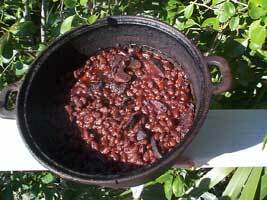 Parboil beans and baking soda for 10 minutes. Skim off crud with slotted spoon. In a ceramic bean pot or tight fitting casserole add enough boiling water to almost cover beans, don’t add too much or beans will be too soupy. Add water while cooking if necessary to keep beans moist.